Climate variability is known to affect the structure and productivity of marine ecosystems (McGowan et al., 1998). Top marine predators may respond to this variation through changes in their relative abundance. In particular, seabirds, which are conspicuous and highly mobile organisms living at the interface of the atmosphere and the ocean, are useful indicators of the variability over geographic space and time in marine ecosystems (Piatt et al., 2007). Counts of marine birds at sea have been conducted in conjunction with seasonal CalCOFI/CCE-LTER cruises since May 1987 (Veit et al. 1996). The resulting database now contains 90 surveys over 26 years, and provide information on seabird distribution and abundance through August 2012. In this article, we illustrate patterns of variability in the relative abundance of two species, the Sooty Shearwater (Puffinus griseus) and Cassin’s Auklet (Ptychoramphus aleuticus) expressed mathematically as the natural log of density (ln [birds km-2 + 1]). The planktivorous auklet is a resident species of the California Current, breeding locally on the Channel Islands as well as Southeast Farallon Island, about 400km to the north of the study region (Abraham and Sydeman, 2004). The omnivorous shearwater breeds in Chile and New Zealand and on other sub-Antarctic islands, and migrates to the California Current during the austral (i.e., southern hemisphere) winter. Both species prey upon euphausiid crustaceans, ichthyoplankton, and small pelagic fish and squid. In the southern California study region, auklets are most abundant during winter surveys (January-February). The auklet population fell from the late 1980s through the late 1990s, but was relatively stable thereafter (Figure 1, upper panel). Between years, we saw peaks in relative abundance in the springs of 1990 and 2005, and during the summers of 2005 through 2007. 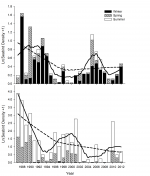 These peaks may be related to poor food availability for auklet reproduction in these years. When there is less food to support reproductive activities, the auklets may remain at sea in search of food, resulting in short-term increases in relative abundance in our at-sea surveys, away from the nesting sites (Sydeman et al. 2006). In 2012, however, there was nothing unusual in the relative abundance of auklets in any season. In contrast to the California Current resident auklets, shearwaters are most abundant during the summer (July-August), and fewer in spring (April-May). During both seasons, the relative abundance of shearwaters declined (Figure 1, lower panel). In 2012, numbers fell even more from recent peaks in both the spring and summer of 2010. While there was a period with general increases in shearwater numbers (1996-2002), overall the trend in this population is strongly negative. As with the auklet, these changes in shearwater abundance may be related to short or long-term changes in food availability. Alternatively, population decreases elsewhere could be affecting our counts--shearwaters have been declining on some New Zealand islands (Scott et al. 2008). The decline in shearwater numbers in the CalCOFI/CCE-LTER region corresponds with a substantial decline in the relative abundance of larval anchovies (Engraulis mordax), though we are unsure if these trends are connected. Inthe coming seasons, we will examine the relationships between seabird distribution and abundance relative to the availability of a variety of prey species, including euphausiid crustaceans, northern anchovies, and other coastal and mesopelagic forage fish. Abraham, C. L., and W. J. Sydeman. 2004. Ocean climate, euphausiids and auklet nesting: inter-annual trends and variation in phenology, diet and growth of a planktivorous seabird, Ptychoramphus aleuticus. Marine Ecology Progress Series 274:235-250. McGowan, J. A., D. R. Cayan, and L. M. Dorman. 1998. Climate-ocean variability and ecosystem response in the Northeast Pacific. Science 281:210-217. Scott, D., P. Scofield, P., C. Hunter, and D. Fletcher. 2008. Decline of Sooty Shearwaters, Puffinus griseus, on The Snares, New Zealand. Papers and Proceedings of the Royal Society of Tasmania 142(1):185–196. Sydeman, W. J., R. W. Bradley, P. Warzybok, C. L. Abraham, J. Jahncke, K. D. Hyrenbach, V. Kousky, J. M. Hipfner, and M. D. Ohman. 2006. Planktivorous auklet Ptychoramphus aleuticus responses to ocean climate, 2005: Unusual atmospheric blocking? Geophysical Research Letters 33:L22S09. Veit, R. R., P. Pyle, and J. A. McGowan. 1996. Ocean warming and long-term change in pelagic bird abundance within the California current system. Marine Ecology Progress Series 139:11-18.